So we were given the DVD Mymo's Adventures from My Gym Children's Fitness Center and pretty excited might I add to get my kiddos moving around. This video is designed to get kids and their parents active and moving about. This is an awesome idea, especially since here in Michigan we have such cold winters, especially this year and weren't able to get out much. This DVD kept my four year old's attention for the entire 45 minutes and she was actually following along and doing the moves that were being shown to her. The synopsis says "The 'Mymo’s Adventures' DVD features the gym’s irresistibly cute mascot, Mymo, as he engages children and leads them on six awesome, interactive adventures. The DVD combines animated fun, live action workouts and a wisecracking puppet named Alphonzo Bartholomew III. “Mymo’s Adventures” is created to educate, entertain and motivate children to be active and helps them to develop their coordination, balance, flexibility, strength and fine/gross motor skills." When it finished she actually said, "that was tough, I'm tired" a plus in any mom's book. She woke up the next day and wanted to do it again -so definitely something she really enjoyed doing and watching. For me - I felt that this was a cute concept, but unfortunately didn't flow very well. I also didn't like the fact that in several parts they wanted the kids to have different props to use, such as a laundry basket for a boat, along with at broom to use as an oar. Because they don't mention this in the beginning, it is difficult as a parent to have things ready for the kids to use without stopping the program. Being a busy mom, when your child is entertained you use the time to get cleaning and laundry done. To me it didn't make sense, when the video was showing the kids in their laundry baskets and one second their was no sign of the monkey then he'd appear but the children would be in front of a blue screen. It seemed that the monkey was on an adventure and then it would cut to the kids doing an exercise that didn't follow with what the monkey was doing. Recommendation: Because half the things she likes I may not understand doesn't mean it was a bad DVD. All in all the thing that matters most is that my four year old liked the DVD and she gives it a thumbs up. Even as I am typing this she is saying, "I want to do this!" while holding up the DVD box. 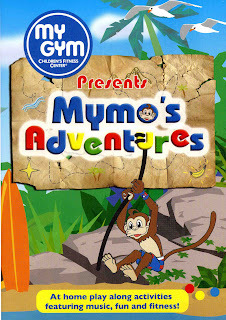 Giveaway: My Gym is going to give one of A Lucky Ladybug's lucky readers a Mymo’s Adventures' DVD of their own! I like that I can find everything I need to find on your blog.